Welcome to Fair Trade Ways Wales. This is a website which records Fair Trade Ways walked throughout Wales, and contains ideas for you to create your own walks in your own communities. 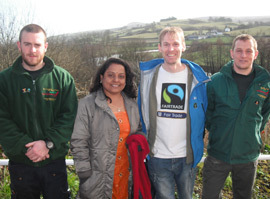 The walks will vary from long distance paths linking Fairtrade Towns to short walks used by campaigners to promote Fair Trade. See any plans for upcoming walks here. The original Fair Trade Way, from Garstang to Keswick in the English Lake District (www.fairtradeway.org.uk) is over 80 miles long. The shortest walk on this site is an example of a Nursery School walking around their local Co-Op looking for goods with the Fairtrade mark. The best thing about Fair Trade Ways is that they can be whatever you want them to be. They can be a lovely social ramble along a beautiful coastal path (Mwnt to St Davids) or a march on your local supermarket demanding that they stock more Fairtrade goods. While we hope ramblers will use this site, it is primarily for Fair Trade supporters and campaigners to use as a resource and as an inspiration as they continue on their journey towards a fairer world.